It doesn't get much cooler than the Mayline Sterling collection. This full service line of professional office desks, reception stations, conference tables, and storage products is ready to take the furniture world by storm in 2016. In today's post, we'll review the Sterling collection and the cutting edge design characteristics that make it great. Enjoy! At first glance, you'll notice the perfect blend of modern and traditional characteristics showcased by Sterling products. Upon closer inspection you'll be wowed by the unmatched attention to detail that Mayline furniture is known for. Hand crafted edges and attractive handle pull make Sterling a pristine solution for professional interiors. What sets this new Mayline office furniture collection apart are the trending finish options. As design teams and shoppers alike have grown bored of traditional tones like cherry and maple, Mayline answered the call with cutting edge tones designed to impress even the harshest critics. All Sterling products are available in Textured Brown Sugar, Mocha, and (our personal favorite) Textured Driftwood finish options! The luxurious executive desks from the Mayline Sterling collection are highlighted by opaque acrylic modesty panels and hutch doors. 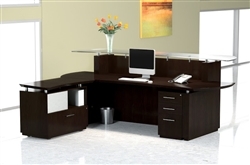 Sterling workstations are available in stand alone, L shaped, and U shaped variations to meet the needs of any space. If you're having trouble finding an out-of-the-box layout to work for your space, there's no need to worry! All Sterling components are available individually. You can work with your dealer of choice to create a custom desk design that's perfect for your interior. Looking to take your conference and meeting area decor to the next level in 2016? 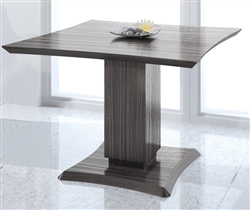 Go with tables from Mayline and their popular new Sterling collection. Those limited on space will love the square top meeting table models available with 42" tops. Larger conference interiors can be outfitted with boat shaped tables from 8 to 12 feet in length! The high end reception desks from the Sterling collection will help create a positive impression on your valued office visitors. These contemporary welcome stations are accented by thick glass trisection counters and unique work surface extensions. Purchasing a reception desk from Mayline is always a good idea. That being said, those from the Sterling collection may just be their best ever. These innovative stations are available in multiple sizes to meet the needs of any space. Based on what we're seeing from competitive brands, these are by far our favorite reception desks of 2016. We give the Sterling collection 4.5 out of 5 stars. This full service line from Mayline is ready to take any interior to the next level. We only gave a half star deduction due to the fact that the conference tables from the Sterling line are not available with optional power modules. To make a long story short, the critiques were minimal. You really can't go wrong with office furniture from Mayline's new Sterling line. The products are well made and easily integrate into both modern and traditional environments. Sterling offers the wide range of components needed to create stylish, well organized work environments built for the needs of any growing business.